All of the league’s top defenses have already been eliminated. In an NFL season marked by historic offensive production and a championship round that was conspicuously absent a top-10 defense,1 aficionados of low-scoring rock fights, filled with punts and field goals, have been left disappointed. The best defensive teams to make the playoffs were eliminated early in the tournament, with the Bears, Ravens and Texans all losing in the wild-card round. A week later, Joey Bosa and the emerging Chargers defense were dismantled by the Patriots, and the Cowboys — perhaps the best defensive team left in the divisional round based on their end-of-season play — lost to the Rams. Extracting the strong defensive teams with relatively weak offenses led to historically exciting playoff football, producing two overtime games in the championship round for the first time in NFL history. Now we have a Patriots and Rams Super Bowl pitting perhaps the greatest QB of all time in Tom Brady against the hottest young offensive mind in the league in Sean McVay. Even then, football is largely unpredictable. When an otherwise sure-handed Alshon Jeffery2 lets a well-thrown Nick Foles pass sail through his fingers for an interception to end the Eagles season, or when Cody Parkey double-doinks a partially blocked field goal to end the Bears’ playoff hopes, we are essentially cheering, or bemoaning, randomness. Most vexing for forecasters and league observers trying to make sense of things is that the plays that matter the most in football are often the most unpredictable. But again, this is particularly true on the defensive side of the ball. 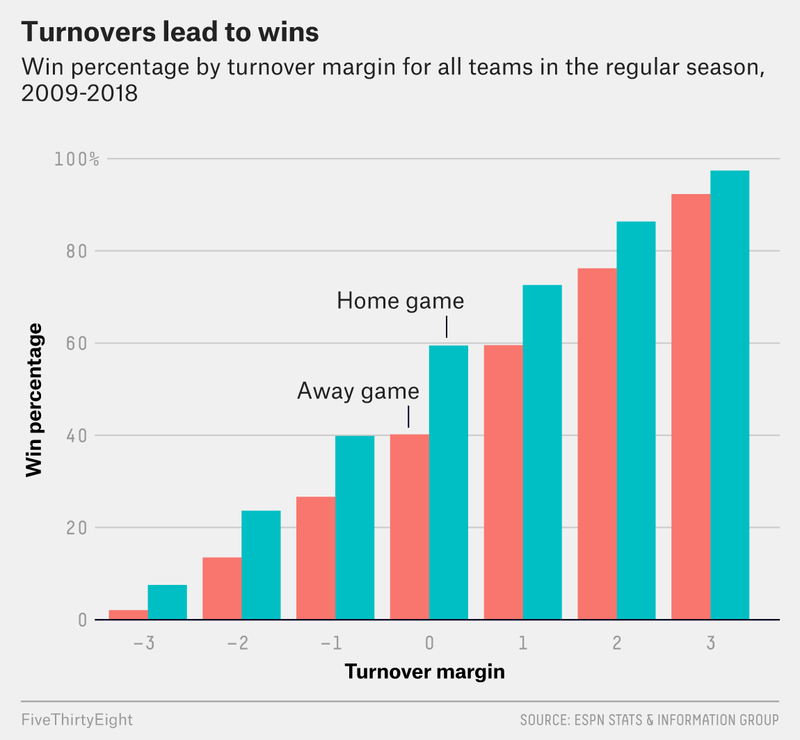 Yet despite their clear importance, the number of turnovers a team creates in one season has no bearing on how many turnovers the team will create in the next. Both interceptions and fumbles are completely unpredictable from season to season at the team level. And this pattern holds true for defense in general. If we measure the stability of defensive stats from one year to the next,3 we find that compared with offensive performance, most defensive stats are highly variable from year to year. 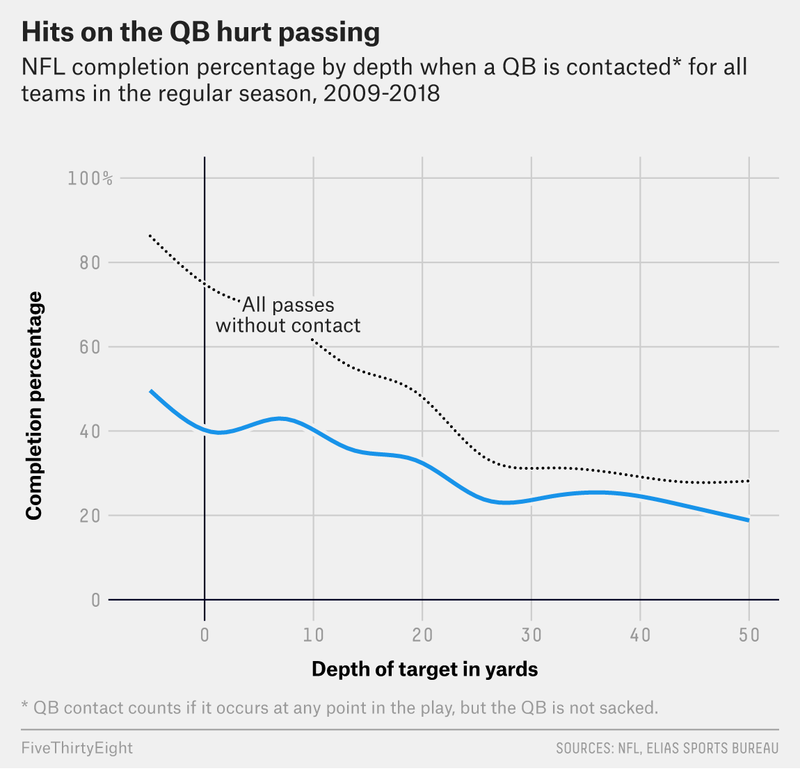 When a quarterback is hit, his completion percentage is affected on a throw to any part of the field.5 Teams that can generate pressure that ends with contact on the opposing QB greatly improve their chances of causing incompletions and getting off the field. And best of all, teams that are good at generating hits on the quarterback tend to stay good at it. According to Football Outsiders’ defensive Defense-adjusted Value Over Average. According to Pro Football Focus, Jeffery had just five drops for the season on 70 catchable targets. Stability measures tell us how well a stat predicts itself over a period of time. Year-over-year r-squared of a metric tells us what percentage future performance, or variance, can be explained by past performance. Based on data from 2009 to 2018. When the hit isn’t a sack, obviously.